On Monday night, WCVB’s Chronicle featured the Wellesley College campus as a Boston-area “hidden gem.” Wellesley's Kristina Jones, adjunct assistant professor of biological sciences and director of the Wellesley College Botanic Gardens, introduced Chronicle viewers to Alumnae Valley and Lake Waban, the Alexandra Botanic Garden and the Margaret C. Ferguson Green Houses as well as the Edible Ecosystem Garden, among other outdoor spaces. Jones reminded viewers that Wellesley’s verdant landscape, which includes 22 acres of gardens and green space—called a “natural paradise” and a “nature lover’s dream” by the show’s anchors and producers—also serves an important academic purpose. 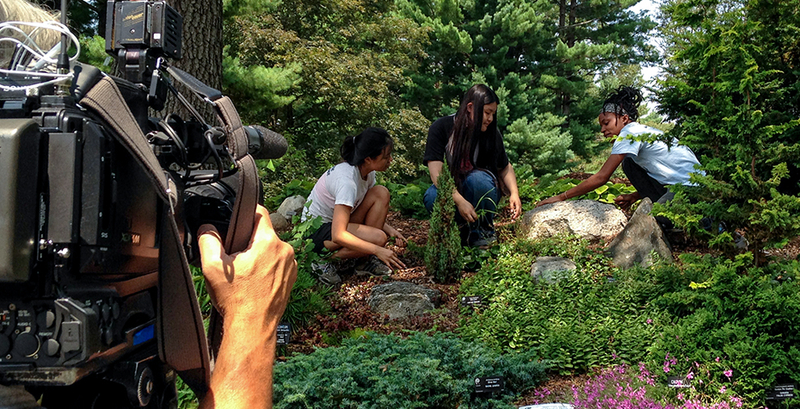 The segment was produced by Sangita Chandra ’94 and also features a brief appearance by the Botanic Gardens' summer interns: Ningyi Xi ’17, Virginia White ’17, and Adiba Manning ’14. The role of the Wellesley College Botanic Gardens as a living, learning laboratory extends to the wider College community and the public too. Upcoming events include a work day in the Edible Ecosystem Teaching Garden on Wellesley's "Day to Make a Difference," on Saturday, September 13; a tour of the research gardens and a presentation on global flora with Kristina Jones on Tuesday, September 23, co-sponsored with the Wellesley College Alumnae of Boston; and children's art classes with instructor Lynda Davis Jeha, an academic administrative assistant in the Political Science Department, on Sunday afternoons starting October 19. Visit the Botanic Gardens webpage for latest news, events, and public programming by the Friends of Wellesley College Botanic Gardens.